A NetEnt classic that's been around the industry for the best part of a decade, Fruit Shop is an online slot game that ticks all the right boxes. Designed to offer just the right amount of entertainment, profit and accessibility, the Fruit Shop slot is a shining example of why a game doesn't need to be hugely complex in order to be fun. Now, some of you are probably thinking that we've lost our minds by suggesting that a simple slot can be just as impressive as a hugely complicated one. Well, in this Fruit Shop slot review, we're going to try and change your minds. After giving you the lowdown on what this game is all about and how to play, we'll outline some of the special features we think make every Fruit Shop slot game a pleasant playing experience! Play Fruit Shop Slot Demo for Free! Play Fruit Shop for Real Money! 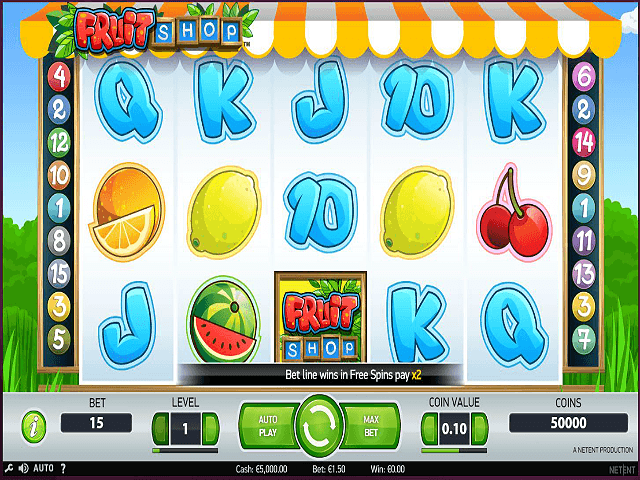 As you'd expect, Fruit Shop online slot games are based on life in a fruit shop. As you spin the five reels and 15 paylines, you'll see everything from card symbols and watermelons to lemons, plums and the ever dependable cherries. Basically, if you've ever played a live or online fruit machine, Fruit Shop is the game for you. Because it takes a classic theme (fruit) and gives it a modern twist, you're essentially getting the best of both worlds. What's more, because betting starts from as little as £0.15, virtually every player can get in on the action. Of course, if you're in the market to win a bit more, you can set the coin value and bet level to their max (£1 and 10 respectively) and stake £150 per round. However, regardless of how you set your bets, the payout table will always stay the same because it's based on coins and not cash amounts. Put simply, whenever you align three or more symbols, the prize is a multiple of your coin size. So, the amount you win will always be the same (proportionally) regardless of the amount you bet. When it comes to special features, Fruit Shop stands out for one reason: free spins. 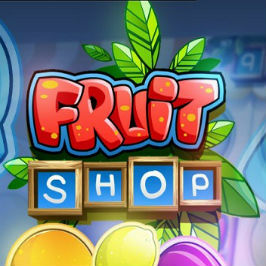 Yes there is a wild (the Fruit Shop slot symbol) that will substitute for any other symbol, but the real reason players play this game is because of the way you can win free spins. 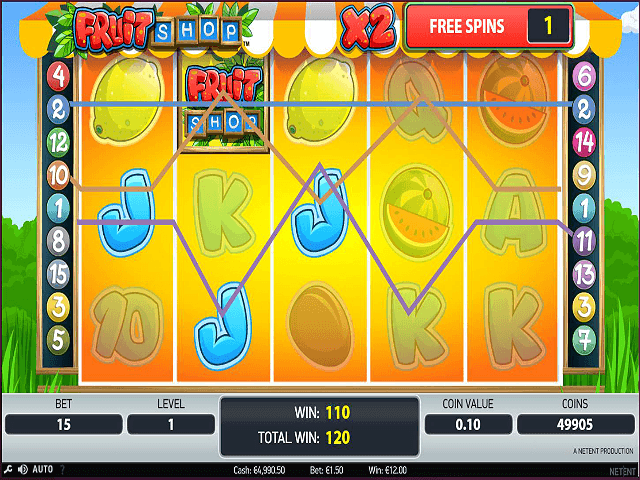 Unlike other online slots where a winning combination equals a win, Fruit Shop does things a bit differently. When you roll in a winning combination of fruit symbols (not card symbol wins), you'll bank a prize and some free spins. In short, you're basically winning twice from a single combination. What's even better about the Fruit Shop free spins bonus is that they can be re-triggered. So, if you've just won five free spins and roll in another winning combo, you'll get extra spins plus an ever-increasing multiplier. This online slots bonus is almost unique to Fruit Shop and the main reason we love it. As we've said, the overall flow of action might be simple, but it's this bonus that makes it worth playing. Regardless of the stakes you play for or the amount of spins you roll through, Fruit Shop gives you more ways to win thanks to its impressive free spins! Share this Fruit Shop Review today! 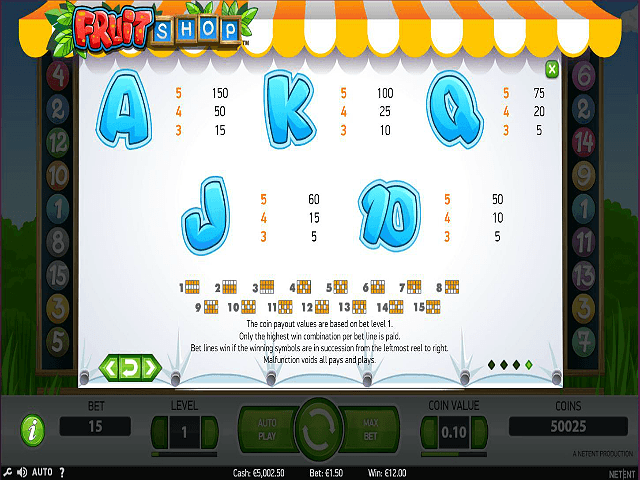 If you like Fruit Shop, you'll love these slot titles too!